By request, I take a brief pause in drafting other posts I’m planning to share a simple dessert I mentioned and pictured in my last post: pear sorbet. During the summer I enjoyed introducing a few of my friends on the McDougall board to the joys of banana “ice cream.” Now I love banana ice cream. But I have a tree full of pears, folks. It’s a grafted tree, so it produces three different varieties and pollinates itself. First come the Bartlett, then the Bosc, then the Anjou. 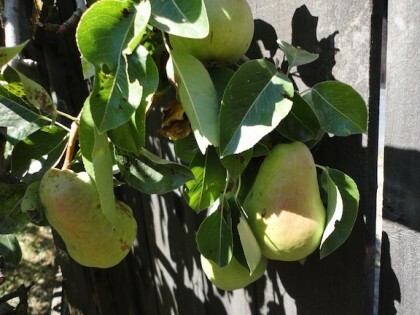 It’s a funny looking sort of little tree that spread out instead of way up, because I tried to train it along the fence so I could reach the pears without having to climb a ladder. The fancy name for that is “espalier,” which means “shoulder” in French. That kind of worked but I wasn’t able to be consistent about it. So some of the branches grow straight up. Some of them drape over the clothesline, and the gate to the vegetable garden. It’s been living in my yard since the year of the MS diagnosis. 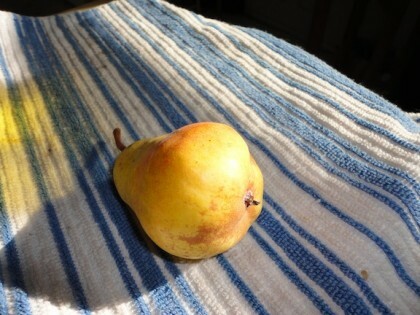 And every season it happens to produce pears, I love them more than ever. They are like eating liquid sunshine. Those of you with MS or some other chronic illness elusive to conventional treatments are probably familiar with people recommending folk remedies, or somewhat “out there” alternative remedies (even though now we all know this “alternative” is by far the most effective one). Like bee sting therapy, for instance. (I know it works for some people, but I am allergic to bees, so that never appealed to my sense of adventure.) My favorite one, though, comes to me through a friend and client from the famous clairvoyant Edgar Cayce. She claimed he recommended those with MS to eat pear cores. Now that’s something I’m willing to try. Every year as I’m slicing up pears for pear sauce, pear butter, pear cobbler, baked pears, or pears on my morning oatmeal, I munch on the cores. I like biting into the star that is the center of the fruit. I like thinking about how eating that star hidden inside a galaxy of sweet white goodness might help me heal. It certainly can’t hurt anyway. Extra fiber. When I bought a Yonana machine this summer as a birthday present for my son Mike, I read some of the recipe ideas on their site. One guy said “try frozen pears. I know it sounds weird, but I kid you not. They are great.” He was right. First, cut up and freeze some ripe unpeeled Bartlett pears. To transpose Shakespeare’s famous words about mortality into culinary context, “ripeness is all.” I recommend you get your Bartletts as close to this color as possible. I put the pieces on a baking sheet lined with baking parchment or wax paper, for at least an hour (this way they don’t stick to each other), then place them in a freezer bag or container. The fruit should be frozen for at least four hours before making the sorbet. Overnight is probably best. Add a splash of almond milk and a splash of vanilla extract. Wait about five to ten minutes for the fruit to soften a little. Whir it up, stopping and pushing it around with a spatula as or if needed. I think I might like this even better than banana ice cream. The texture is lovely. It’s wonderful just as is, but I also like it with some buckwheat groats and a little ground nutmeg sprinkled on top. Maybe a few more fresh pear pieces on the top. So if you like pears, give this a whirl. If you’re using the Yonana, try tossing the frozen pear pieces with the almond milk and the vanilla in a bowl while they are waiting the five to ten minutes to defrost a little, then just put the coated pieces into the machine. Sounds like you have the same problem as I do!! (Such a “problem,” yes?) I probably could make a lot more stuff with my pears but what I really like best is to just eat them!! And I am a gonner over liquid sunshine, too. Well, I’m gonna try this. I’ll have to adapt for South African pears, as I know Bosc, but not the others. Will also have to start making some almond milk. Thanks, Maria. You’re welcome, Jane, my pleasure. Let us know how you do with the Bosc pears. I imagine they’ll provide their own unique magic for this dish. And I hope you enjoy making the almond milk. It takes a little time, but it’s really quite easy and worth the effort. I do it pretty regularly, except for the times Lazy Girl has taken over my body. Thanks, Oly!! Glad to share it with you. Thank you, Oly! I am glad to share it with you. I will have to try this one for sure. it sounds so yummy. I do have a yonana little machine, but really, I think that a food processor may be just as good anyway. cannot wait to find some peers to freeze up! Last night we adventured out to the “Palm Court Jazz” in the French Quarter of New Orleans. We were able to get the kitchen to make us some vegan no oil fare and for dessert we got a fruit soup. It was chilled cantaloupe that had been pureed on a flat bowl with a banana and some seedless grapes. Delicious. I am also a fruit tree grower and love eating out of my yard. I recommend it highly and get fruit the first year after planting bare root trees in January. Then like clockwork I get fresh fruit each year. The bother comes when the critters, squirrels, birds and possum knock it out of the tree and it makes a mess on the ground. Definitely worth the mess it to me. Thanks for sharing about your lovely dessert in the French Quarter of New Orleans: it sounds ambrosial. And yes, I can’t say enough about the joys and benefits of eating fruit from my own yard. And I agree it’s all definitely worth the mess! I enjoy reading your posts! I, too, am a former Swank dieter who converted to vegan after meeting Dr. McDougall. I am much happier being meatless and dairy-free! But I seem to fare better (more improvement from exacerbation damage, more strength and stamina) if I maintain the Swank-recommended 20-50 grams of good oils per day, including 5 grams of cod liver oil. This has caused some bit of weight gain, though. Do you maintain an oil-free diet? If so, do you feel that oil-free works better for you than ingesting the Swank-recommended good oils each day? How long have you been meatless and dairy-free? Thank you for your questions. It’s nice to chat with another traveler on the Swank-McDougall continuum. I started out doing this vegan. I will be at it 5 years this coming February. In the first year, even though I had read in the Multiple Sclerosis Diet book that “linseed oil” i.e flax, could be substituted for it, I tried to take some fish oil, since it was considered so important to those following the plan on the Swank Discussion board. This did not work out well for me. I didn’t digest it well and actually felt worse. Using any oil seemed to exacerbate hormonal fluctuations and aggravate my rosacea as well. So pretty early on I went to other sources of omega 3s: in particular ground flax seeds and walnuts (kale and romaine are also sources, and I eat a lot of both). I had also read in Dr. Swank’s book and elsewhere on the Swank Foundation site that while between 20-50 grams of the good oils were allowed, staying at 20 (or below) was optimal, and of that 20, keeping the saturated portion of that at 5 or below was best. Then I also read Dr. Jelinek’s first book, who himself has MS, and follows a somewhat more stringent version of Dr. Swank’s fat allowances. His understanding of Dr. Swank’s foundational work and reasons for modifying it made sense to me, though I couldn’t repeat them exactly here. I do recommend his work. Then I also read Dr.Esselstyn’s Prevent and Reverse Heart Disease. While this book does not address MS directly, it is based on more current dietary research about blood flow and heart disease. Very early on, Dr. Swank made the connection that the same diet that treats MS also treats heart disease. In fact the first addition of his book, which came out in the late 70’s has both of these conditions in the title. I asked the library for this book, too, so I could see what he said about it. I decided that taking Dr. Esselstyn and Dr. McDougall’s guidelines to heart (pardon the pun) could do nothing but ALSO help the MS, which arises from a vascular problem to begin with. In time, I settled on gold flax seeds, because they are easier for me to digest and I like them better. I read somewhere they are a bit higher in fat than the brown, but I’m not sure how much. Another friend I knew on the Swank discussion board was also eating vegan and using ground flax seeds. I know I need at least a tablespoon of those each day (this is Dr. Esselstyn’s recommendation). I have that a teaspoon at a time on each of my three meals. In addition to that I may have a very small amount of walnuts or additional flax or other nuts or nut butters within a recipe. I never go over a total of two ounces of any of it in a single day, and usually I’m not having that much (the tablespoon of flax seeds is about 1 oz). So my fat count by Swank standards is probably low. But it seems to work very well for me. Not having to worry about weight gain also helps my mobility. I do need that flax, however. So in my experience, some is needed, but not quite as much as was thought, at least in my case. And for me, it’s much healthier if it’s not in oil form, but closer to whole food, as in grinding up the seeds fresh. I hope that helps answer your questions. I just found your awesome response to my questions. Thank you so much for taking the time to respond in such detail, and with such great information! I have been adding a tsp of fresh-ground flax per day, but also including canola or olive oil in my recipes. I’m keeping my sat fat at negligible levels, but I think, especially due to my inability to really exercise the last few years, I’ve just been ingesting too many good oils. I’ll trend back toward McDougall/Esselstyn, but keep taking my CLO and additional ground flax each day. I’m sure the extra weight will come right off. It’s so validating to hear from someone else who’s living successfully with MS that ultra low-fat vegan eating, along with about 20 grams of fat from fresh-ground flax each day has been so helpful! Thanks again, and have a wonderful Thanksgiving! You’re very welcome, Valorie! I hope you have a wonderful Thanksgiving as well.